Support Vineyard Conservation! 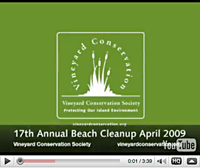 (Vineyard Conservation Society) Vineyard Conservation Society | Member support makes our work possible. Member support makes our work possible. Whether you are joining, renewing your membership or responding to an environmental action appeal you can be sure that your contribution will be put to work here on the Vineyard. We are strictly an Island organization, not a regional or national one. VCS will never share your information. Are you a first-time member? If so, please call or email our office to receive one of our thank-you gifts. Is this a gift membership? If so, please call or email our office to receive one of our thank-you gifts. If this is a gift membership, please enter the name and address of the recipient below. I'd like to receive the Conservation Almanac. Vineyard Conservation Society has partnered with Network for Good to securely process your online credit card payment via Network for Good (tax ID 68-0480736). This transaction will appear on your credit card statement as "Network for Good." This transaction is subject to Network for Good’s Privacy, Security & Disclosure Statement and the Charitable Solicitation Disclosure.